It’s time to meet one of our newest team members, Ryan, who has seriously wowed us with his skills in videography! If you haven’t seen our latest videos, you NEED to pop on over to our YouTube channel and watch his stop motion and animation creations- they’re a real treat to watch! 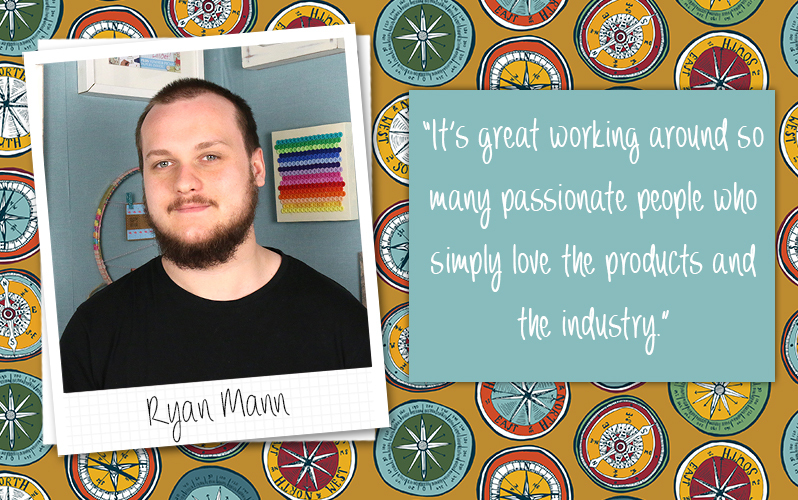 We thought you’d all enjoy finding out about his creative role at Trimcraft, so why not give our Q & A a read to find out how he brings our pretty products to life and what he likes to get up to in his free time! I’ve been with the team at Trimcraft for just over a month, I’m excited for many more! My job is to showcase the wonderful products Trimcraft has to offer through video, be it tutorials or fun product videos! I always start my day with a train journey to the office, watching The Office on my phone (funnily enough). I’m then greeted by the team and jump straight into my work! For each project I familiarise myself with the product and begin to brainstorm my ideas to bring the product to life. I then jump into filming (my favourite part). After that I add all the whistles and bells for you guys to see on our social media. The best thing for me is the encouragement by the team to be creative. It’s great working around so many passionate people who simply love the products and the industry. I myself work in the marketing team, it’s great to have a team of people who are creative! The support and feedback I get whilst creating my videos is wonderful too. My favourite product at the moment is the Grand Plans pad, the designs are great and I had so much fun creating the video for it. My favourite hobbies are music, American Football and film making. In my spare time I play bass in a band, we’ve done a few tours but you won’t hear about us on the radio anytime soon unfortunately! American Football is another big passion of mine, I’ve supported the Seattle Seahawks for well over 10 years now, and I’m hoping one day to attend a game over there. When I get chance I also like to create music videos and short films. I’m not the best by any means but I love creating things from scratch, my girlfriend also works at a craft shop so I always chip in whenever she’s feeling creative. That’s a tough one. I’d like to think I’m thoughtful, creative and optimistic. I’d invest a good chunk of it on camera equipment, I’d a bit of a camera nerd. I’d also definitely buy my grandparents a house and a lovely holiday and finally a ticket to a Seahawks game! I’m absolutely terrified of butterflies, ever since I was a kid. I remember visiting a butterfly house and crying all the way through.